Following National Autism Week, this article poses the question, “Can you cope with autistic people simply being themselves?” Click icon to view the article. What is it like? or Sensory sensitivity might also be worth a look. Ten Ways Kids Appear to Be Acting Bad But Aren’t. When we recognize kids’ unwelcome behaviors as reactions to environmental conditions, developmental phases, or our own actions, it lets us respond proactively, and with much more compassion. Click icon for this article from Psychology Today. Oxford associate professor has a new interpretation of autism distinguishing it from alexithymia. He concludes, ‘Individuals with autism are not unempathetic, psychopathic monsters. 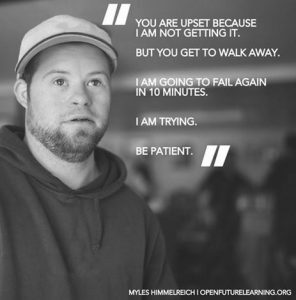 This is really important … I have heard so many stories about people who simply cannot get jobs or even volunteer their time because of this damaging myth, which causes additional frustration for the parents of autistic individuals. Individuals with alexithymia are also not psychopaths of course, although they may struggle to understand emotions in a typical way.’ Click icon for article. Also, here is his full interview. How to help people with autism? 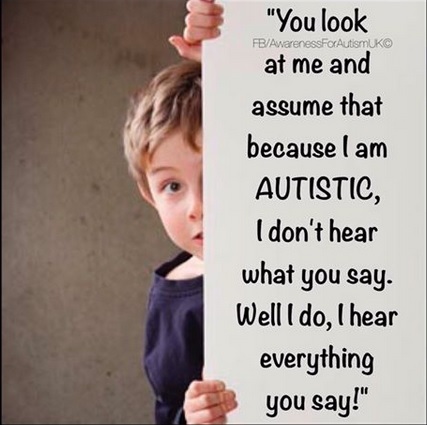 One of the most difficult things about autism is the judgment of other people. Right now, we are just grateful for any moments of understanding and kindness from other people. Click the icon on the left to see the article. When Mark and Julie Neary adopted five-year-old Steven, they never imagined that 16 years later they’d be fighting for his right to simply live at home. It was a fight that lasted almost a year. After all, why would they think that was a risk? Steven was just your every-day kind of kid. He loved football, ABBA, and Mr Bean. He also lives with severe learning difficulties. Click icon to see article. Here is a video clip that illustrates sensory overload, once more produced by the National Autistic Society (NAS). The NAS is seeking to raise awareness of of the information overload that autistic children/people can experience. See: awareness–page video clip of a boy in a shopping centre. This video clip simulates the experience of someone with sensory sensitivity. First it shows a walk with everything well adjusted then repeats the walk simulating the sensitivity. Try to imagine what it’s like inside my head, then you’ll see. I’m not being rude. I’m not being naughty. I’m not sick. 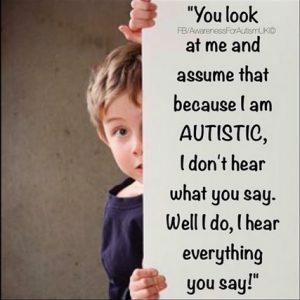 I have Autism … and I’m just being me. What a meltdown feels like? “Why are you freaking out?” “That child having a tantrum just needs some discipline.” “What a brat!” Fifteen people on the Autism Spectrum describe what a meltdown feels like. Click icon on the right for article. A young lady puts aside the worry and fear of embarrassment and judgment and tries to explain what lies behind the spectacle that one’s own meltdown creates. See article. What is the Geek Syndrome? Jim has autism – Jim would like to spread a little awareness. Be Jim’s Friend is his Facebook page. A letter written by 6-year-old Lex Camilleri has gone viral thanks to its powerful message about the importance of educating people about autism and other conditions. See article. Radio 4 has been broadcasting a series of interviews about Autism. A conversation with Professor Simon Baron-Cohen was aired on Tue 17th Feb 2015. He is a highly respected authority on autism. On Tue 24th Feb 2015, an interview with a university research assistant with high-functioning autism was aired. She explained her experience of life with very clearly. You might still be able to listen to these radio podcasts of these 15 minute programmes. Both still available on-line as of Aug 2017. Getting the right help for a child can be an up-hill struggle. For anyone unfamiliar with the process this video could be a bit of an eye-opener. Click icon on the right to watch it.